When music director Paul Ford launches into that well-known Sondheim vamp leading into “Another Hundred People,” and the lights come up on Patti LuPone and Mandy Patinkin wearing basic black, somberly standing side-by-side, you know this isn’t going to be one of those brassy, chatty, cabaret-inspired concert acts. Instead, they’ve assembled something more daring and creative: a minimalistic evening of song and scene that tells a non-linear love story. Here are two hyper-talented performers who could easily get away with revisiting roles of yore with the “he sings, she sings, they both sing, and repeat” formula. And if you’re coming for that, you might be disappointed. However, if you enjoy two amazing stage talents doing what they do best — story telling — you’re in for a treat. 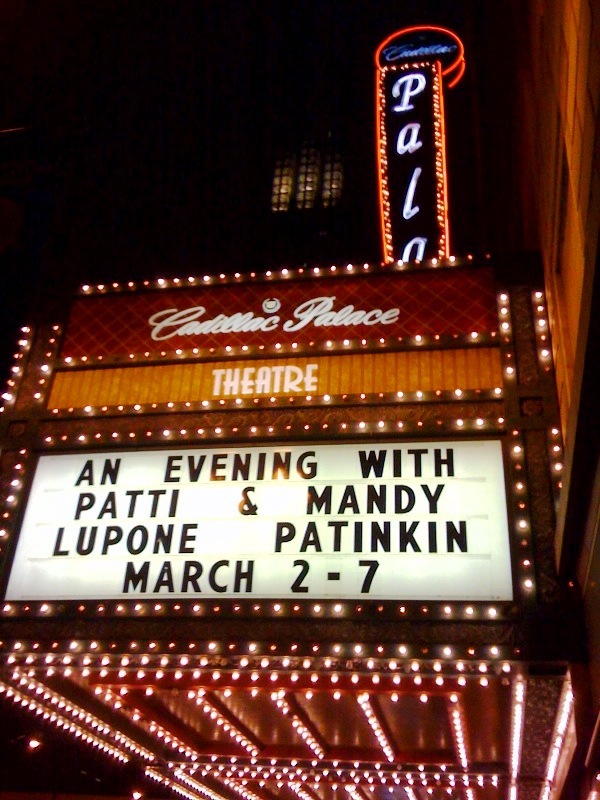 LuPone and Patinkin are two incredibly unique performers with two entirely different approaches to material. She caresses a song with throaty vocals, oftentimes nearly breaking into a sob in the heavier moments. Where such emotions aren’t called for, tears are usually stuck in her eyes, ready to leap out at a moment’s notice. And as much as I’m sure she’d disagree, there’s always a slight nod to her fans (which are plenty in Chicago, probably cultivated from nearly a decade of high-profile Ravinia performances). Her physicality is also entirely her own: feet firmly planted, a slight swish in the hips, strong hand movements punctuating key phrases and a wide, expressive mouth featuring a jaw that seems to come unhinged when a big note comes along. Patinkin, on the other hand, is a jokester. He plays around with a song, oftentimes modulating his voice in counter-intuitive ways. He yells lines that you don’t expect, and goes into a falsetto whisper during phrases that typically warrant fortissimo. Staccato is his preferred approach. His typical stance is leaned over, eyes glimmering and squinted with hands out wide, as if he’s intently trying to convince you of something necessary. Ok, I’ll admit it now: I’m not a fan of Patinkin, and this evening didn’t change that opinion, but I entirely admire his talent and dynamic stage presence. For the many reasons I can name for disliking his style, I can easily see how LuPone detractors can apply those very same attributes to her. And that’s the thing: these two performers are so special, so comfortable in their own performance language, so uncompromising in being true to themselves, that they polarize opinions and fans. In other words: they certainly aren’t boring! However: what we can all agree on is how much these two love performing together. There’s a clear sense of respect and joy that permeates the air of the Cadillac Palace stage. Together, they weave in and out of classic musical theatre songs, oftentimes ironically juxtaposed (for example, “April in Paris” is followed by “April in Fairbanks” — complete with charming choreography by Ann Reinking). Buttons to numbers are often cut, swiftly moving into the next song or scene, as if to force the audience to sit still and listen. Act two concludes with an emotionally dense performance of the “bench scene” from Carousel. But, as a whole, the evening is a delight (and short! The two acts clock in at only two hours). So. There are two skilled and accomplished talents squatting in the Loop for a week. Go see them! Who knows when, or if, we will ever have the opportunity to encounter musical theatre stage talent of this kind again. They’re a dying breed. What a lovely review! I’m glad you enjoyed it, and that you can appreciate MP without liking MP. And agree that they both need a very strong director. Thanks! Yes, I certainly can appreciate MP, but he’s just not my cup of tea. i’m surprised you didn’t mention the “don’t cry for me argentina” disappearing act… it’s fine that it wasn’t performed and i wouldn’t have had as big a problem with it being omitted, if it hadn’t been printed in the playbill. that overshadowed a lot of the positive buzz as people were leaving the theater, i noticed. i also thought it was odd that MP sang “somewhere that’s green” and not PL. i would have much preferred to hear her sing it than him. Hi, Jason – thanks for commenting. Also: keep in mind the mention at the bottom of the song list noting that the list could change without notice. I can certainly understand. It’s her signature song! Whatever the reason, it’s an unfortunate oversight. Previous Post What are you doing this Thursday? Next Post How do YOU make opera less ordinary?